Perms, mullets, shoulder pads, and bright neon clothing were things meant to stay forgotten after their bout of popularity in the 80’s. But there were a few wonderful things that originated in the 80’s: Pac Man, Super Mario Bros., Tetris, and Donkey Kong to name a few. The pixelated animations of these glorious games are often nothing more than wonderful memories or niche favorites for those who appreciate classics. Luckily, the iTunes store has become a place where old school games like Aylex Mobile Application’s 8-Bit Race is available to meet the demand of those who fondly remember large pixel games. For those who don’t remember the 80’s (or simply were not yet born), 8-Bit Race was a hit arcade game which featured a car racing down the highway. The app version has gotten a bit of a face lift with its re-release for the iPhone and iPod Touch. Gameplay is still the same though. Users will steer the car between two lanes of traffic: there are cars moving up and those that are going down. Control where your vehicle goes by simply tilting your iPhone or iPod Touch to steer your vehicle left or right. Dodge different cars and collect power-ups along the way. The longer you last, the more points you’ll collect. Just remember to collect fuel cans otherwise you’ll run out of gas and game over. This racing action game has great, easy to use controls and interface. There’s even online leaderboards because of the game’s integration with OpenFeint. Users can accumulate over 23 different achievements if they wish which is a nice update on the old classic. The soundtrack and sound effects also have a cool, retro electronic feel. The music loop was even long enough so that it doesn’t become grating and hinder play. It’s nice that the audio can also be turned off from the options page. As for the graphics, they looked like pixelated bit graphics. Animations were also simple and nothing outrageous–they too remained true to the classic game. 8-bit Race accomplishes what it intends to do. It tries to bring the game into the 21st century with online leaderboards and integration with OpenFeint. But it doesn’t do anything more than that, and there’s nothing wrong with that. A classic is a classic for a reason. I love old school racing games, and 8-Bit Race deserves props in its own right. However, many users may feel that the game’s price tag is too high for what it offers. For $0.99, this game is cheap enough to hold the attention for those who are nostalgic for the good old days but it won’t take up front page iPhone real estate. Users will be able to play in two different modes, but play can become a little repetitive. Most of today’s younger app users will probably not appreciate the appeal of this classic and will seek a better value elsewhere in terms of graphics, animation, and replay value like Jet Car Stunts for $1.99. This game will not hold up against the newer, flashier releases in the iTunes store so check out the trailer before you buy. But who knows? 8-Bit Race may have a resurgence in popularity just like the bright neon clothing does every decade. 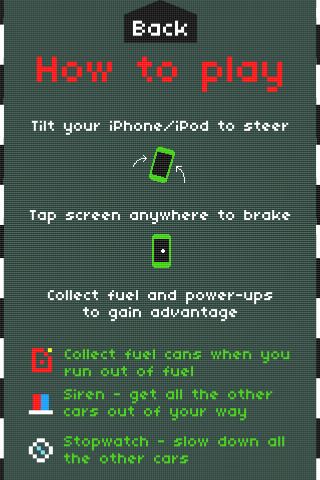 AppSafari review of 8-Bit Race was written by Linda Ta on May 11th, 2010 and categorized under Action, App Store, Fun, Games, Physics Based, Racing. Page viewed 4136 times, 1 so far today. Need help on using these apps? Please read the Help Page.